December is both a joyful and stressful time of year! We have bills to pay and daily responsibilities to maintain all while adding special Christmas shopping, events and festivities to the load. This makes WEIGHT LOSS even more of a challenge; especially when it comes to the tempting food, drinks and extra work. Yet, most of you are still trying hard to make healthy changes, so you can at least maintain and not gain weight. You really have to be careful not to let a treat or two turn into months of binge eating and ultimately failing at losing weight in 2016. UPDATE - RACHEL M IS THE WINNER OF THE FREE BOTTLE OF SKINNY FIBER. I would like to encourage you to STAY ON TRACK ... Read this whole post!!! please leave a message and I will call you right back. The cost for one bottle of Skinny Fiber is normally $59.95 + shipping. With this special your final cost is $55.95 plus you get a a free bottle of Ageless ($59.95) and an entry to win a free bottle of Skinny Body Max. I will ship your direct order within 24 hours (Sat orders after 12 pm est ship Monday) and send you the tracking details. NOTE: Instant Rebate + Gift Special lasts until all 23 bottles in inventory have been sold --- I will update this page with details --- or until December 31, 2015. All sales final! 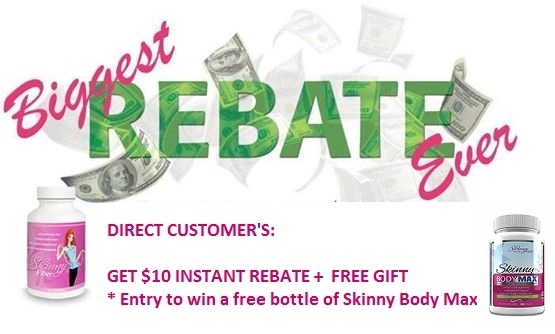 PLUS, earn an entry or entries to win a free bottle of Skinny Body Max ($59.95 value). CLICK HERE to order SKINNY BODY MAX online! CLICK HERE to order SKINNY FIBER online! NOTE: Rebates will be issued after 30 days on 1 bottle orders and after 90 days on 3 or more bottles! Rebate is void if returned! 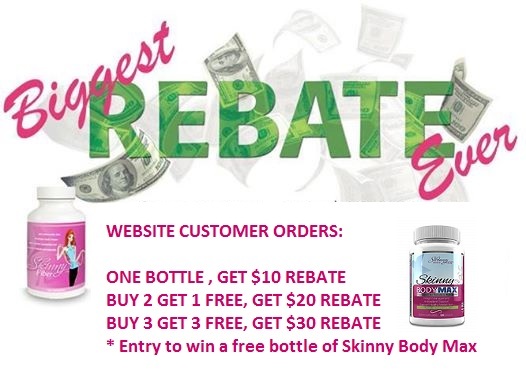 Rebates work in conjunction with the company's 30 day guarantee on one bottle and 90 day guarantee on 3 or more packages. Both rebate offers are offered personally by me and not the SBC company. I will select the winner for the Skinny Body Max drawing on January 7th and announce by the following day on this blog. I will also contact the person directly. Please do not hesitate to contact me directly by the link above or phone with any questions or concerns you might have. I am here to make this an easy process for you and get your Skinny Fiber and Gift out quickly.